Having room to grow is vital in a greenhouse. 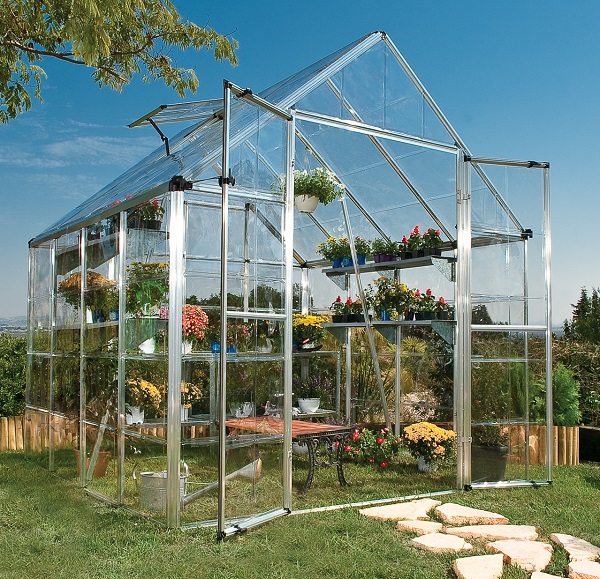 The Palram Snap & Grow 8 x 12 Hobby Greenhouse provides considerable room for you budding garden. One hundred square feet of growing space and 8.5 feet of headroom with extra-wide double doors leave plenty of room for you and your plants to spread out. It also includes two adjustable roof vents and rain gutters. And to make sure that your plants get plenty of light, this greenhouse offers 90% light transmission and 100% UV protection. Flourish today with this spacious greenhouse from Palram. How thick are the polycarbonate panels? The top and side panels are .04 ml thickness.